Two early first half goals proved to be enough as the No. 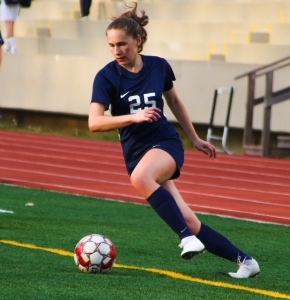 7 ranked Dunwoody Lady Wildcats defeated the North Atlanta Lady Warriors 2-0 in Region 7-6A girls’ soccer play at North DeKalb on Friday night for their eighth straight victory. Camryn Lampron had a hand in both goals for Dunwoody (10-4-0, 6-1-0) including the only goal the Lady Wildcats would need in the game as she got into the box to beat North Atlanta goalie Lily Mason just 1:43 into the first half to make it 1-0. The score would remain the same for the next 11 minutes until Lampron got off a shot on goal that was blocked by Mason, but right to Dunwoody’s Sarah Holland in front of the goal for an easy tap into the open net for a 2-0 advantage with 27:06 remaining in the first half. North Atlanta (6-5, 0-5) almost cut the lead in half just under a minute later but Dunwoody goalie Lindsay Jerome came away with the save on a big shot by the Lady Warriors. The clock was ticking down to the seven-minute mark of the half when Jerome went up in the air to secure another shot on goal to keep the advantage at 2-0 for the Lady Wildcats heading into the half. Dunwoody got a penalty kick just four minutes into the second half, but North Atlanta’s Mason made the save to keep the game within reach at 2-0. Mason would come up with another big save with 27 minutes to play as North Atlanta continued to hang around in the second half. Dunwoody substitute goalie Ella Holland put together a pair of big saves in the final two minutes of the game batting away good shots by the Lady Warriors to preserve the 2-0 margin of victory. The victory was Dunwoody’s eighth since a tough 3-1 loss to No. 1 ranked John’s Creek earlier in the season. The Lady Wildcats have rolled off region wins against Centennial (3-0), Chattahoochee (1-0), Alpharetta (3-0), Pope (2-1), Northview (4-0) and now North Atlanta (2-0) since that only region loss. 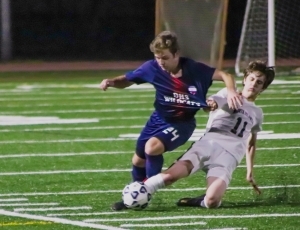 The North Atlanta Warriors picked up their first Region 7-6A win of the season as a two-goal flurry in the final eight minutes of the first half broke a 1-1 tie on the way to a 4-1 victory in the nightcap at North DeKalb Stadium. North Atlanta (4-8-1, 1-4) grabbed the early lead at the 33:49 mark of the first half as Brooks Buckelew put a header into the net for the 1-0 lead. The game remained at 1-0 for the next 23 minutes thanks in part to Dunwoody goalie Bryn Andrews stared a North Atlanta offensive player to block a shot to not allow North Atlanta to increase the lead. Dunwoody (2-7-4, 2-4-0) was set to tie the game at 1-1 as a direct kick into the box was headed into the goal by Joshua Hitt. Unfortunately for the Wildcats, North Atlanta regained the lead at 2-1 as Ryan Soyah put a shot in the left lower corner of the net with 8:20 remaining in the first half. A penalty in the box on Dunwoody gave North Atlanta’s Alex Phillips a penalty shot that he put into the left corner as well to extend the lead to 3-1 heading into the half. Despite some chances both teams went scoreless until just 18:26 was left on the clock with North Atlanta’s Roman Anicacio found the net to make it 4-1. Dunwoody could not get the offense into score mode and North Atlanta ran out the clock to get out with the 4-1 victory over Dunwoody.